We loved this CG and the staff. Only stayed 1 night traveling back home to Ohio from Arkansas but will definitely stay here again if in the area. We were on a concrete pad, very level, and did not unhitch. This park had anything you would every need as others have mentioned. Nice views. Very enjoyable. We camped at Parkers Crossroads RV Park and Campground in a Travel Trailer. Quaint little Park. We had an awesome site. Loved the view. Would stay again if I had the same site. We only stayed for one night We camped at Parkers Crossroads RV Park and Campground in a Fifth Wheel. Awesome little park with outstanding management. Very friendly and helpful office staff. Stayed here overnight on out bound and in bound travel. Nice concrete pad sites are available for overnighters (sites 29-35). We were in site 33 which had no neighbor on the passenger side, opened up to a nice patio and unobstructed view of the lake. Quiet at night since the park is a mile or so off the interstate but easy access off the state highway. All utilities worked as expected. I very much appreciated that they had propane at a very reasonable price. Also they have on-site repair service available should you need help with an RV problem. A great value along I-40 in Tennessee. and a park I would highly recommend. We camped at Parkers Crossroads RV Park and Campground in a Motorhome. Stayed here coming and going from Oklahoma to the east coast. Beautiful setting near a civil war battlefield. Fast food and cheap diesel close by at I-40 interchange. The owners are some of the nicest folks I've run into. Very professional and helpful, giving out interesting information packet at check in. RV service on site by co-owners. Propane was available and very cost friendly. Park was nicely decorated with Christmas decorations. Quiet setting with nice pool and pond. Great place to walk dogs. Shiloh civil war battlefield within driving range. Honestly, this is an extremely well run RV park and I will always look forward to staying here again. AT&T internet with a strong signal. Highly recommend this one. 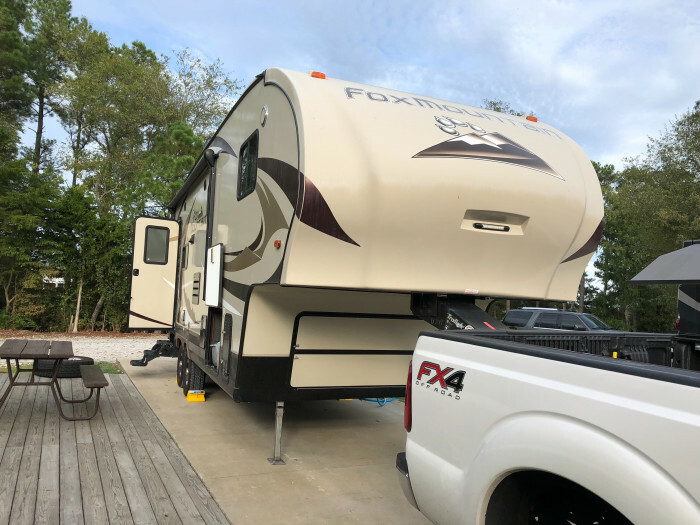 We camped at Parkers Crossroads RV Park and Campground in a Fifth Wheel. Beautiful, country setting. Great location halfway between Memphis and Nashville. Sites had concrete pads and spaced far apart. Very clean. There is no dog park but plenty of land to walk around including a pond with ducks and seating. Farm with views of cows behind RV park. Not too far from highway. There are restaurants near the interstate entrances but recommended to bring food with you. Just a great place to relax. Cable very good, WiFi average. 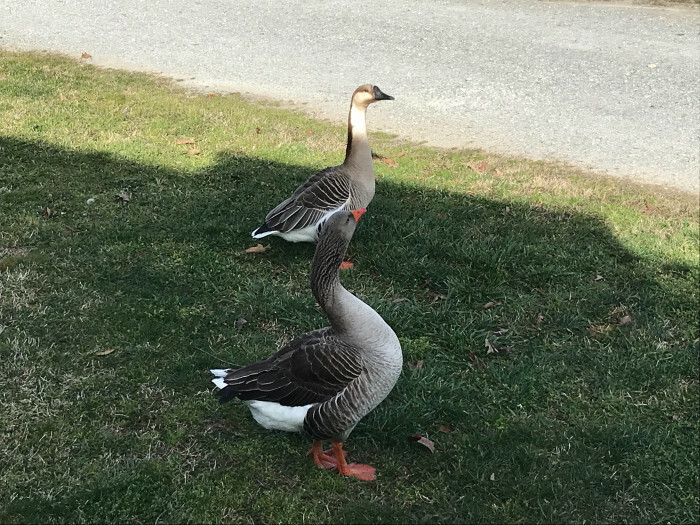 We camped at Parkers Crossroads RV Park and Campground in a Motorhome. Historic area with Civil War era battlefield. If we had the time, we would have visited. The owners have taken great pride in this campground. Really enjoyed the pastoral setting after long, long journey from Arizona to Florida. The pictures are the website are accurate . Hope to stay there again on next big trip out west. 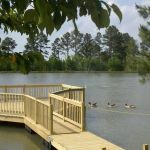 Parkers Crossroads is the epitome of the way an RV Park should be run. This was our fourth stay and won't be the last. How do we love you, let me count the ways: Very friendly hosts, easy check in, guided us to our site. Lots of information at check-in about the park, amenities offered onsite and in the area. Far enough from interstate that it is very quiet. Very level concrete pull through, so we didn't have to unhook unless we wanted to go to our favorite Patty's Restaurant for catfish. They have pizza onsite that can be delivered to your door. LP Gas available, firewood, RV repair services. We camped at Parkers Crossroads RV Park and Campground in a Motorhome. I was told at check in, the men's restroom is under repair. The site has concrete slab with table, and nice layer of gravel on road. Beautiful park with small lake. The lady mgr. went over their booklet point by point which included restaurants, gas stations, with a map. Also all the emergency numbers. This being my first time in the area, I really liked the info page, "Things to do at park and area". They also have RV repair available, I spoke to one of the technicians, and I would trust him to work on my class 'A'. I will look forward to our next RV trip and a stop at Parkers Crossroads, TN. We camped at Parkers Crossroads RV Park and Campground in a Motorhome. We stayed 3 days on our way to Pigeon Forge, last year we stayed one night, but this time we stayed longer to visit the Shiloh Battle ground, on our returned from Pigeon Forge we stayed 2 days. We really love the place; I highly recommend this place. 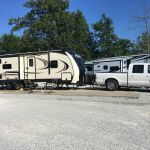 We camped at Parkers Crossroads RV Park and Campground in a Fifth Wheel. 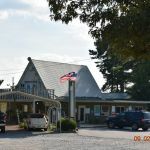 Make sure you visit Shiloh National Park and Parkers Crossroads Battlefield, if you visit Shiloh National Park, make sure to eat at Wilma Hagy Trust DBA Cat Fish, great place! if you are staying close to the campsite, visit Smader's Gill & Scratch Kitchen. If you have been on the road, the park offers frozen pizza they will bake it inhouse very convenient. Nice check in. Congested park with confusing, narrow roads. It was difficult to figure out where to drive. Nice level concrete pad with wood deck. No grass or tree at site. Not pretty. We had a site on the edge, so had a nice view. Nice feature: they have Digiorno pizza that they will bake and bring to you. Pool was an in-ground vinyl-liner type but was closed while we were there. Good laundry. Great WiFi. Cable. Thorough literature that even included instructions of how to get places like Walmart. No circuit breaker on electric. 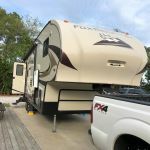 We camped at Parkers Crossroads RV Park and Campground in a Fifth Wheel. If you have tire trouble (we did), this park recommended Best One Tire in Jackson, and so do we. Great park but better people. Will definitely stay here again. 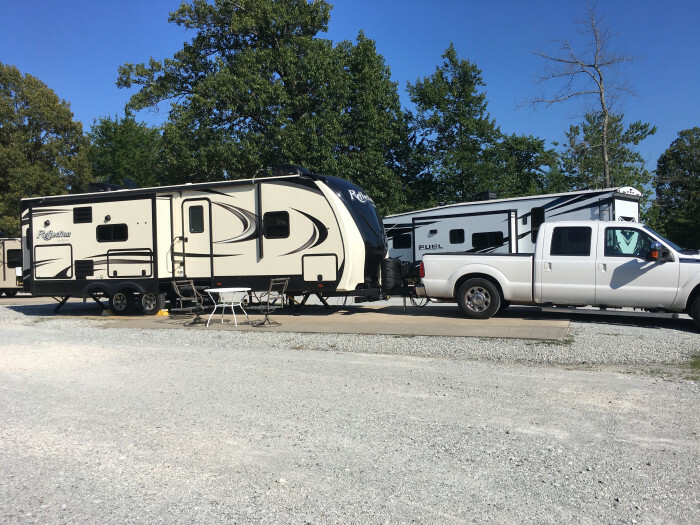 We camped at Parkers Crossroads RV Park and Campground in a Fifth Wheel. We needed an oil change, which they did for a reasonable price (on site and a service offered by the campground) and in addition fixed a leaky a/c. Very nice folks fitted us in. Plus the WiFi was super, stream with no problem, lots of other amenities for fishing and kids. We highly recommend this RV Park, best in 3 months driving around the country this summer. We camped at Parkers Crossroads RV Park and Campground in a Motorhome. On our way west we had planned to stop overnight at Parker's Crossroads, having had good experience there previously. This time, we experienced a blowout of a trailer tire which punctured a hole in the trailer floor. Finally arriving late in the evening after the office had closed, we were met by campground co-owner who explained that we were in luck, as the campground also offered RV repairs. True to his word, at 8 the following morning, he and another employee started work to patch the hole in the floor of our trailer and had us set to leave in less than an hour. We were certainly delighted with this pleasant and prompt service. You don't find such delightful and helpful folks very often. The campground is about a mile north of I-40, far enough to mute traffic noise yet not inconvenient. Most sites are gravel, although there are a few concrete pull-thrus. Water pressure is high, so be sure to use a pressure regulator. The campground staff are friendly and helpful. There is a very inviting crystal clear swimming pool. Parker's Crossroads is a very pleasant campground and we will undoubtedly stay there again. 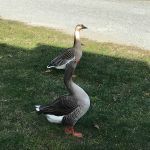 We camped at Parkers Crossroads RV Park and Campground in a Travel Trailer. Great cable, WiFi, and Verizon. Cement pad was very level. Table and chairs instead of picnic table was a preferred option. Our truck and trailer had plenty of room. The sites were close but staggered therefore giving the illusion that they were not. The staff was very friendly and we loved the fact that they were email efficient. We received a request email for a confirmation that we only had to click confirm. Another email came with names and phone numbers when we checked in. And another one when we checked out saying thank you and hope you come back! Propane is filled by weight so fill up here. They will cook a pizza and deliver to your door. They had a very comprehensive brochure. There were multiple big rig friendly gas stations nearby. Beautiful grounds with a catch and release pond. We camped at Parkers Crossroads RV Park and Campground in a Travel Trailer. We stayed for a week on a pull-through cement pad with patio. Lots of one-nighters, but the park was clean and quiet. Definitely would recommend. We camped at Parkers Crossroads RV Park and Campground in a Motorhome. There are a number of good restaurants in the area. Our favorite was Patty's Restaurant. The fried chicken there was outstanding, and we ate there three times! Smarder's was also good. There are a number of Civil War sites in the area, a State park and some nice driving trails. Parkers Crossroads Civil War Battlefield and Cemetary near by. There is a Dollar Store close by. Larger stores require more driving. Campground is 1.2 miles north of I-40 Exit 108 on the righthand side of TN-22. There are services at the exit; including diesel, gasoline and 'some' food. Parkers Crossroad Battlefield is nearby - I highly recommend. Several state parks within 30 minutes for those looking for hiking and enjoying the outdoors. Shopping nearby but not in walking distance. We do not have a tow vehicle so they offered to drive us. Great Civil War history in the area! Not a lot to do here but you can't beat the peace and quiet. We've been here before and the service is as expected. Great all the time. Not a lot to choose from in the area for restaurants but Tucks for BBQ is still the best available here. If we are back in this area again we will be stopping again. Patty's Restaurant is an excellent place for dinner and breakfast. Also don't miss the Parkers Crossroads visitor center with a nice Civil War museum. The staff offers to cook and deliver a DiGiorno frozen pizza for $8.75, tax included. This was a nice lunch treat. Shiloh National Park about 30-40 minutes south; historic area. I want to return here as we travel out again in fall as a stop on our way to VA, and take a few days to explore the area and soak in some history. Had ancestors who fought at Shiloh in Civil War. Great shopping nearby, lots of history nearby. Parkers Crossing City Park has a nice walking path, just about a mile away. This is a Civil War site. You are 12 miles from a WalMart Supercenter in Lexington and 48 miles from Shiloh Battlefield National Park. Two gas stations have a separate area for trucks and provide diesel at a lower price than the larger truck-stops. There are a number of local restaurants within 4 mles of the park. Nice quiet park kind of out of the way but still close to interstate 40 and within reasonable distances to shopping and services. Near the Parkers Crossroads Civil War Battle Grounds. Only a couple of miles to major stores and shopping and restaurants. Parkers Crossroads is a Civil War Battlefield. There's a nice visitors center and walking tours nearby. PC RV Park also has an RV maintenance and repair facility on site, as well as wash-wax service available. Gas and facilities at interstate. Lots of Civil War history in the area with Visitors Center providing information about events, re-enactments and self-guided tour of battlegrounds. Not far from Natchez Trace SP and only 50 miles north of Shiloh National Military Park. Wineries, fresh water pearl farm, antiques and museums close by. Civil war sites nearby. Fresh water pearl store. The little market in Clarksburg has terrific meat...it's worth a trip. Easy on and off the highway. Good entry road. Drive to Union City through Huntingdon and look at the homes. Drive to Lexington and view homes. Beautiful plantation type mansions. Visit the local civil war museum and the Parkers Crossroads battlefield. Patty's drive through restaurant is great. The local restaurant. Was very good. Make sure you see the Battlefield. Very interesting. We had supper at Mallard's in Huntingdon. Good food. Make sure to take a 50 mile side trip to see the Shiloh National Battlefield! Civil War history is all around. Buford Pusser's home and museum is also located in Adamsville, on the way to the battlefield. The Parker Crossroad battlefield sites are interesting and should be visited if in the area. Fort Donelson is relatively close and worth the drive. Visitors center has info on Parkers Crossroads Civil War Battle. Shiloh National Military Park is 50 miles away. Oma's Antik Haus is close, as are several museums including Indian mounds and Casey Jones Museum. There are also three local wineries. See furnished packet with extensive information.